Register now for the job fair! Would you like a chance to meet and interview with recruiters representing a big variety of companies? 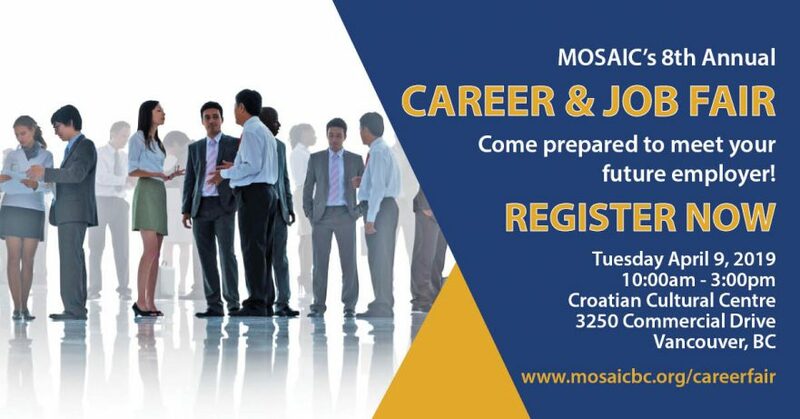 MOSAIC’s 8th Annual Career & Job Fair provides a unique opportunity to showcase your skills to 70+ employers across many different sectors. Save the date! How you conduct yourself during your job interview may well be a determining factor in whether you get the job you want (which might not otherwise happen if your resume alone doesn’t stand out enough to warrant an interview request). Determine which of the businesses at MOSAIC’s Job Fair match your career objectives and make a list of your target employers based on their needs, and your skills and interests. A first impression is formed within seconds and can have a direct impact on your success in finding a job. Your appearance, body language and communication are all elements of the image you present. Are you projecting the image of a competent, confident, trustworthy and approachable person? Most interviewers make their decision about a candidate within minutes! Think about how you may come across to others and how you can improve on that first impression. Analyze your appearance: Do your clothes and personal appearance project an appropriate image for the position you’re applying for? Consider the workplace environment – is it a formal, or more casual setting? Fine-tune your verbal communications skills: Show good manners by being courteous and attentive. Speak clearly, concisely and don’t rush your words. Practice this in your daily interactions until this feels comfortable. Be positive, open and confident: Stand tall, make eye contact and greet others with a firm handshake and a friendly demeanor. Focus on the interviewer(s) and don’t be distracted by your nerves or your surroundings. This question comes up in most interviews, whether it’s phrased exactly this way, or in some other way. Recruiters want to hear what you have to say about yourself and the way you respond reveals a lot about you and contributes to the overall first impressions. You would think this question is simple to answer, since we know ourselves quite well, but often, we stumble over how much to say, what to say, and how to say it. Your self-introduction should be a concise and well-presented message that quickly provides enough information about you to pique the listener’s interest. Although you want your pitch to sound spontaneous, it is very important to prepare and present yourself in a credible and professional manner. Make your pitch easy to listen to and to understand. Use plain language and ensure that it answers these three critical questions: Who are you? What are you looking for? What do you have to offer the employer? You will want to specify your skills and experience, and speak about your accomplishments, but don’t brag! Practice your pitch until it sounds conversational and authentic. Record it and listen carefully – change anything that doesn’t sound natural, or that you have difficulty with. Try it out on family and friends and ask for feedback. And keep practicing until it sounds natural!